INVOICE SORT ORDER: We have now implemented a setting that allows staff members to choose the sort order when printing invoices. With this new sort order dropdown, you can sort based on the customer name, invoice date, invoice number, invoice total. If a cover letter is selected, the sort order option is not available. It will sort order See a screenshot of where this new setting is. This was a UserVoice item. EMAIL SIGNATURES: You are now able to attach an email signature to emails when sending out invoices (either through the Sales/Invoices tab or the Pending Delivery tab). PRINT STATEMENTS: You can now easily print statements for members by going to a contacts billing tab and using the orange actions button or the purple quick actions button. Both areas now have an option to print statements, which allows you to choose which ones to print. AUTOMATED REMINDER EMAIL: You are now able to automatically send out an Event Reminder email 48 hours before the start of your event. This new setting is located on your event Overview Tab, under the General Information settings. See where this is. Once enabled, 48 hours prior to your event, the Event Reminder email template will be sent to those that are registered. You can customize your event reminder email (under Setup> Email Templates) and set your customized email template to be used (under Setup> Automated Messages). See step-by-step note in the wiki. EASILY EMAIL NO SHOWS: You are now able to easily email your event registrants that have been marked as "No Show." In your event, under the communications tab, you will see the new "Send Email to No Shows" item listed under the orange actions button. See where this is. This was a UserVoice item. EVENT INVITEES: When a contact is sent an event invite, they are now noted as "invited" in their activity log on their profile. Previously it said “registered” even when users were just invited, so this confusion has now been resolved. See a screenshot. EVENT WAITING LIST: Staff members can now register a registrant that is on the waiting list without issues or duplications. On the attendee tab, when a waiting list user is registered (whether by staff in the back office, or end users re-registering using the registration page), it will now automatically show that first "waiting list" registrant as "Canceled" and the new registrant as "Registered." See a screenshot of where this is. Note: If the user selected sessions in their original registration, their sessions will not be transferred to their new registration (because sessions could be full). Staff members will have to use the actions button and "view sessions" to reference what sessions they originally selected, and manually add them to the new registration. MATCHING ICON IMPROVEMENT: The “create association” icon was previously not very intuitive. We have now included additional information in the message that comes up to help you better understand what organization you are associating the contact to. See a screenshot of the updated message. ATTENDEE RESULTS COUNTER: You will now see on the Event Attendees Tab that there is a results counter (that will change based on your search criteria.) This gives you a quick look at how many users you have selected. See a quick video of this – no audio. TEMPLATES ALLOW FOR ATTACHMENTS: You are now able to add an attachment to an email template. Meaning when that template is used, the email will automatically have it attached. See a video of how to do this. This was a UserVoice item. PAYMENT GATEWAYS: You are now able to select a different payment gateway for each of your fundraising campaigns, just like you can with events. This allows users to more effectively collect funds for PAC (or any other campaigns) through the fundraising module. See where to set the payment gateway on a fundraising campaign. SAVE FROM A SAVED REPORT: You are now able to save a report off of an already saved report. To do this, you will now see two options in the dropdown underneath the "Run Report" button. You can save any changes you have made to your current saved report, AND you will see a "Save As New Report." See where this is. This was a UserVoice item. Both the EVENT ACTIVITY REPORT and the EVENT DISCOUNT USE REPORT now have Event Category as a filtering option. TOTAL SPENDING BY CONTACT REPORT – now has a membership status filter. SALES BY CONTACT REPORT, formerly known as Sales By Member Report – now has Transaction Type, Product category, Saleable Item available as fields to display. MEMBERSHIP/NEW MEMBERSHIP REPORTS: Membership Type and Good/Service Item as filters on top and fields to display. SALES FUNNEL REPORT: Membership Type and Good/Service Item as filters on top and fields to display. OPEN INVOICES REPORT: We've added "Assigned To" as a field to display. INVALID EMAIL REPORT: The Invalid Email Addresses report now has the "Status" field to display, so you can see if your contacts are active, dropped, etc..
a family - it will show the primary contact for that Family. NEW HOMESCREEN: You may have noticed, we have made the Metrics Tab the home screen that you will see upon login. These dashboard widgets are accurate, customizable, and can be used as your own personal dashboard screen. TOTAL MEMBERSHIP WIDGET: You can now select a custom date range for the Total Memberships dashboard widget, by editing the widget and selecting custom. Users are able to select the start and end date for the information that they want displayed. NEW EVENT WIDGET: There is now a new Events dashboard widget that you can pull in (by clicking the Add Widgets button). This new widget (see screenshot) will show you how many attendees were registered for any/all events by month, over the last year. There are some customize options under the gear icon, and selecting edit. Options such as paid events only vs. all including free, limit to a particular event, and limit to a particular event category. See screenshot of customization options. NEW MEMBER CATEGORIES WIDGET: You will now see another new dashboard widget that will display your Membership Categories in a pie chart, helping you to see the breakdown of your different membership categories. To add this new widget: from your dashboard click the “add widget” button, and then select “Membership Category.” This was a UserVoice item. The resources area has a fresh new look both in the card-view - which is the default view - (see a screenshot), and in the list view (see a screenshot). We have removed the type dropdown when adding a resource from the Info Hub. When adding a file or link, it will automatically determine what it is by the file type or domain address. When a Staff member uploads a file to the Resources section of the Info Hub, and they limit access to a specific list/committee, they are now still able to see the file they've uploaded even if they are not a contact in that list/committee. DEFAULT CALENDAR VIEW: You can now set a default view for how your Events Calendar is displayed in the Info Hub. For example, all Info Hub calendars are defaulted to display in Month View. However, association staff members can now easily make the List view the default, by going to Setup> Info Hub Settings > Enable list view checkbox. Watch a video on how to change this setting. This was a UserVoice item. BLUETOOTH CARD READER AVAILABLE: We have added support for a new wireless (Bluetooth) card reader on iOS devices. 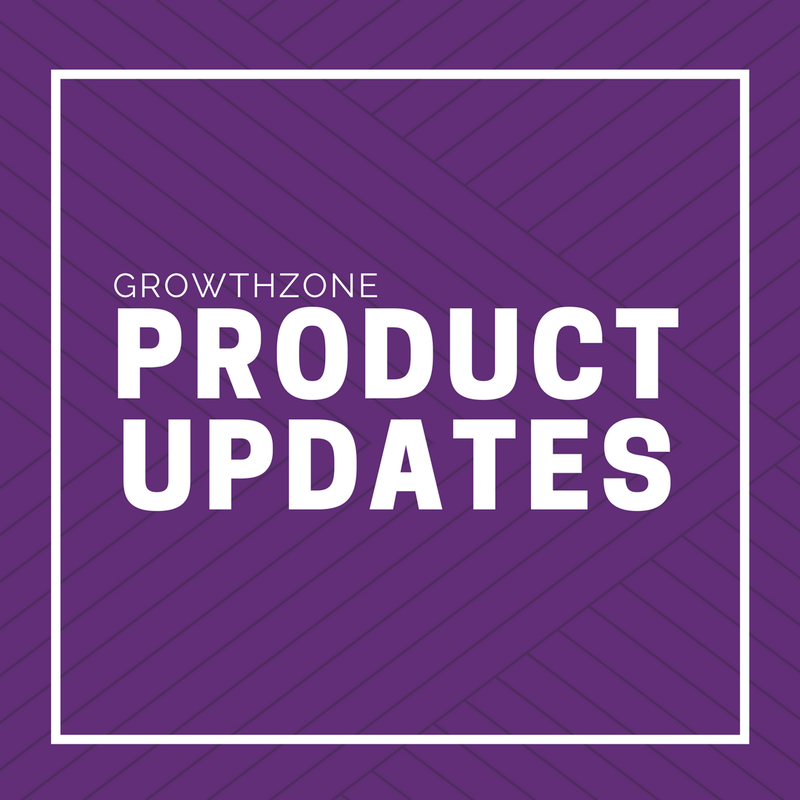 This can be a great new option for staff members using the GrowthZone Staff App who may have had connection issues with prior card readers (likely caused by their cases not letting the jack reader seat properly). For more information on our Staff App and our supported card readers, visit our support wiki. AUTOMATIC FIELD AREA: When creating a custom field from within a module, you won't need to select the field area in the dropdown. It will automatically be set to the area you are creating from. You will still see the field area dropdown when creating a custom field from Setup> Custom Fields. ARCHIVED: In the manage custom fields screens throughout the software, you will now see an archived column, helping to better visually see which are archived. DIRECTORY: When adding a custom field to a directory, you now have the ability to select which Directory Listing Types you want it displayed in. When you select a listing type, it automatically adds it to that listing type. This eliminates the need to add in two places. See a screenshot. STATEMENTS TEMPLATE: You will now see that there is a payment link in the Statements template. This link was put there on request of a few customers. If, however, your customers do not want the payment link to be shown in their statements, you can easily remove it. Watch a video of how to do that. INVOICES TEMPLATE: We've added a merge field to the invoices template to be able to pull in an individual’s primary business. This was not added to the base template, but is available to pull in if needed. The field you will need to add is <<PurchasedByNamePrimaryBusiness>> See a screenshot. Here are step-by-step instructions on how to add a merge field to a document generation template.